The Hindu New Year 2076 or Vikram Nav Varsh Samvat in the traditional lunar Hindi calendars followed in North India – especially in Uttar Pradesh, Himachal Pradesh, Haryana, Madhya Pradesh, Rajasthan, Uttarakhand, Bihar, Jharkhand, Jammu and Kashmir, Punjab, Delhi and Chhattisgarh is celebrated on Chaitra Shukla Paksha Pratipada (March – April). In 2019, the Nav Samvat begins on April 6. The New Year is first day after the Amavasya (No moon) in the month of Chaitra. The current year is known as Paridhavi Samvatsar (परिधावी संवत्सर). As per Hindu astrology Paridhavi Samvatsar will have Shani as King and Surya as Minister. The vehicle of the year is Mahisha or Buffalo. People offer prayers on the day for a happy and prosperous year. 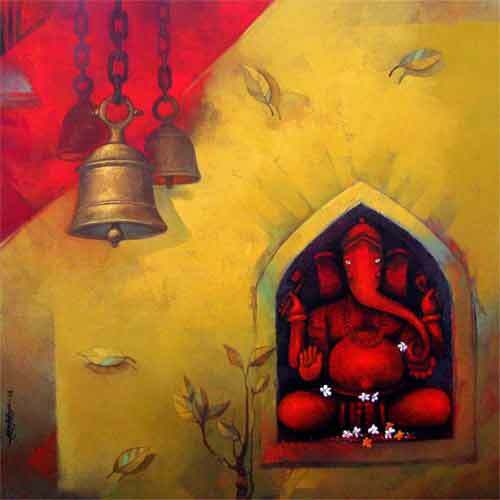 First prayer is offered to Ganesha. Note: Nav Varsh Samvat 2076 in Gujarati calendar begins on October 28, 2019. Note - Saka Era 1941 begins on April 6 in Maharashtra, Goa, Andhra Pradesh, Telangana and Karnataka. Vikram Era was started in 57 BC by Emperor Vikramaditya as a commemoration of his victory upon the Shaks. This victory took place at Ujjain, one among the four places associated with Kumbh Mela. This Hindu calendar is also known as Vikram Samvat. According to the traditional Hindu calendar followed in North India this is year Vikram Samvat 2074. This calculation of Hindu New Year is based on the Luni-Solar calendar. A month in the calendar is calculated from the day after full moon to full moon (Pratipada tithi after Purnima to Purnima). This is known as Purnimanta system. The calendars followed mainly in North India are based on the Amanta and Purnimanta system. Amanta calendar is calculated from New moon to New moon. Purnimanta is calculated from Full moon to Full moon. Amanta is used in some places for calculating festivals and other auspicious days. The Amanta Lunar calendar starts with Chaitra month. Amanta is used to fix all the major Hindu festivals in North India. Even those communities that prefer the Purnimat calendar use Amanta calendar for fixing festivals. It must be noted here that Gujarat follows a different calendar system and there the New Year falls on the day after Diwali – the calendar is popularly known as Vikram Samvat – the current year in Gujarati calendar is Vikram Samvat 2076 (It will change only on October 28, 2019). Similarly, the official Government of India calendar, the Saka Calendar, has its New Year in Chaitra month but it falls on March 21st or March 22nd. Are Present Hindu Calendars Faulty?